A simple chicken pasta salad with a delicious lemon herb dressing! Hi everyone! Chelsea back from Chelsea’s Messy Apron and today I’m sharing one of my all time FAVORITE pasta salad recipes! And since I can’t get it out of my mind, I had to create my own take/twist on that recipe! 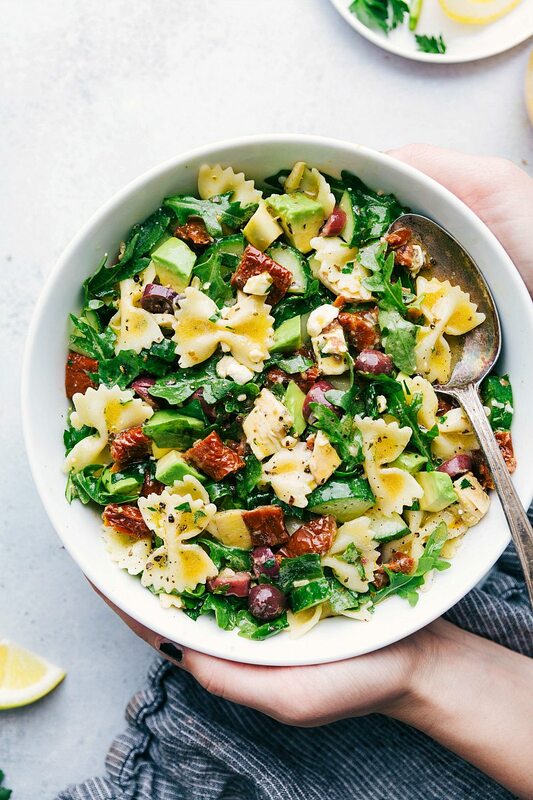 Grab a pasta that has a lot of ridges: I like using a pasta that has a lot of ridges and texture as it allows for the dressing to coat it better and get into all the nooks and crannies leaving you with a more flavorful pasta salad! Add your favorites! 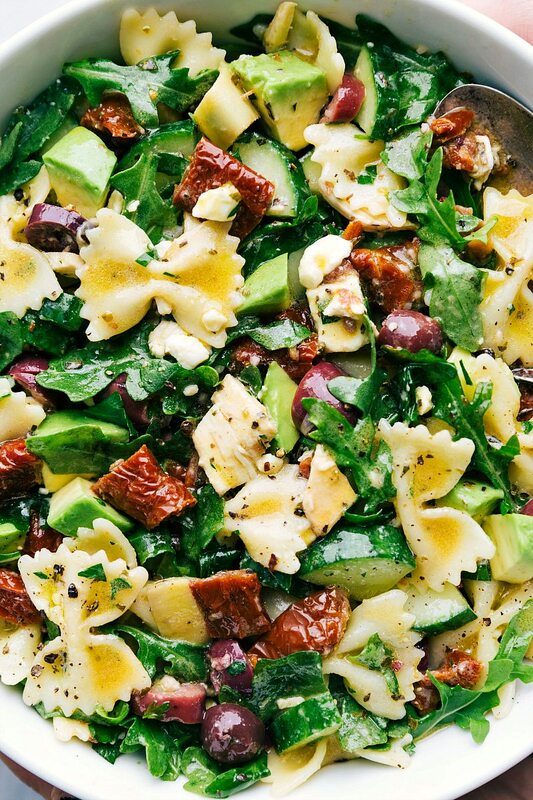 This pasta salad is LOADED with lots of ingredients. If you aren’t a fan of some (or even a few) of the ingredients, leave them out and simply increase the quantities of the other salad additions. This salad is very easily customizable and you can make it exactly how you’ll love it! This salad has some chopped rotisserie chicken in it, but you can easily leave it out to make this salad vegetarian. Alternatively, you can cook your own chicken or use some chopped leftover grilled chicken to add some extra protein to the salad. Use good quality jarred ingredients. The jarred artichokes, olives, and sun-dried tomatoes can be meh or really great depending on the brands you buy. I highly recommend DeLallo’s (not sponsored, I just love their products) sun-dried tomatoes and oil packed artichokes for this salad. You also want to make sure you get the sun-dried tomatoes that are packed in oil and not the sun-dried tomatoes in a packet. 8 ounces pasta, I used farfalle, any smallish pasta works great! Cook the pasta according to package directions until al dente. Drain the pasta and rinse it under cold water to help it to stop cooking and come to room temperature. Drain off any water and place in a large bowl. 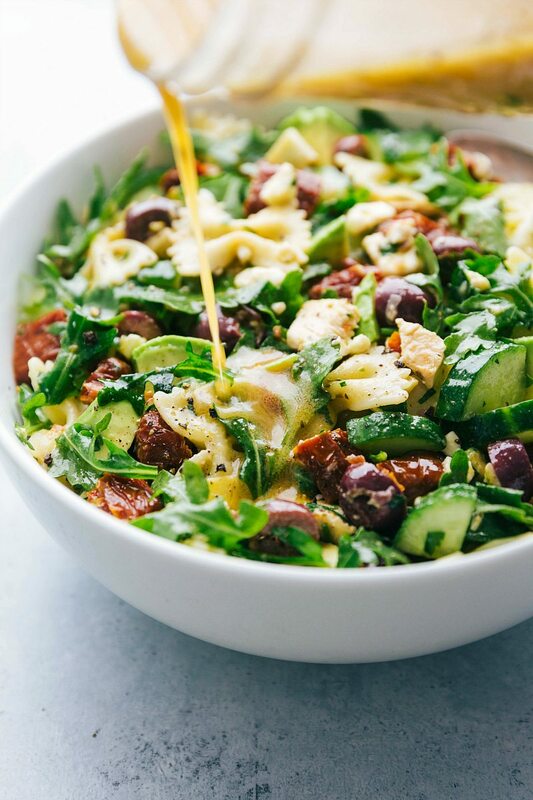 Add the chopped rotisserie chicken, coarsely chopped sun-dried tomatoes, coarsely chopped artichoke hearts, chopped cucumber, coarsely chopped kalamata olives, arugula, and parsley. Toss. If not eating it right away, cover the salad and store in the fridge. If you are eating this right away (and not having leftovers) add in the avocado and feta cheese. Meanwhile, prep the dressing. In a mason jar, combine the red wine vinegar, Dijon mustard, dried oregano, dried basil, garlic, ½ teaspoon salt (or to taste), and ¼ teaspoon pepper (or to taste, honey (add to sweetness preference), olive oil, and freshly squeezed lemon juice. Place the lid on the mason jar and shake to combine. Store dressing in the fridge until ready to dress the salad. When you’re ready to serve, add the feta and chopped avocado. Dress with the prepared dressing. Adjust any seasonings (salt and pepper) to taste and serve. Oooh this pasta salad looks so fresh! 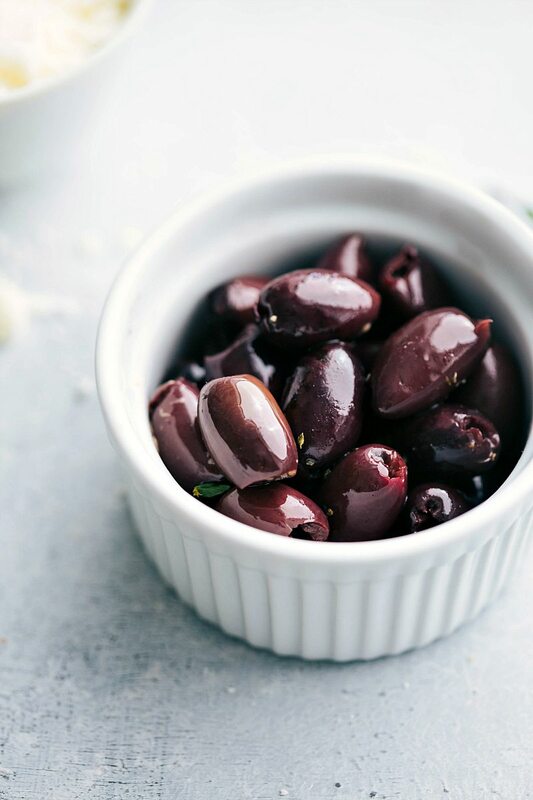 Artichoke hearts and olives are a great addition.